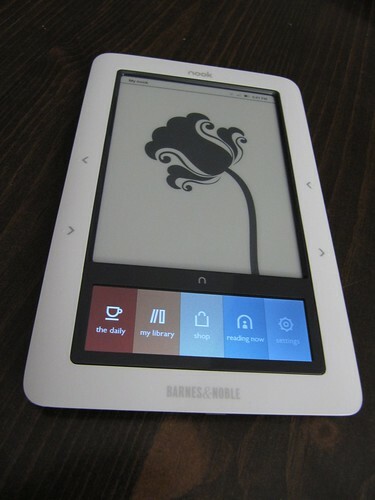 My birthday present to myself arrived yesterday: the new Barnes & Noble “nook” ebook reader. As you probably know, ebooks and ebook readers have been a hobby of mine for a while now. I’m rather passionate about ebooks. So of course I had to get a nook to see how it stacks up. The look of the nook is great. The front is smooth slightly glossy plastic, with a matte finish on the buttons on either side of the screen. The back is a slightly rubberized plastic that feels comfortable in my hand. The weight feels good, and it feels sturdy overall (though I wouldn’t want to drop it). The buttons don’t have seams, and have a nice click to them. The buttons are on both the left and right edges, so it’s good for left or right handed use. The side buttons do have one major flaw in my mind – they are reversed. When I hold the nook, my hand is comfortable gripping it by the side, with my fingers on the back and my thumb resting on the edge. But my thumb rests on the upper button, which is the “previous page” button. To go to the next page, I have to bend my thumb down every time, which is uncomfortable, or hold the nook by the bottom edge, which is also less comfortable. Lying on my side in bed, I found myself holding the nook with one hand and tapping the “next page” button with my other hand, obviously not ideal. This button issue isn’t a dealbreaker, but it’s such a basic error it makes me wonder what sort of person tested it – after holding it for one minute, my conclusion was that the “next” and “previous” buttons should be switched. The e-ink screen looks great, same e-ink technology as in the Sony and Amazon devices. It has a gray tone to it, nowhere near as white as paper, but is very easy to read. No built-in light source, so you’ll need a reading lamp or some sunlight, same as a paper book. As with other e-ink screens, the screen takes about a half-second to refresh, and does it with a sort of a blink, which some people find offputting. I’ve never had an issue with it, I find e-ink very easy to read from. The nook’s particular hook is the second screen, a small LCD touchscreen. I found the initial brightness of this screen way too high, especially next to the non-light-emitting e-ink screen, so I turned the LCD way down, to 7% brightness. This screen is an interesting workaround to the slow refresh rate of the e-ink, and not cluttering up the device with lots of buttons, like the Kindle. 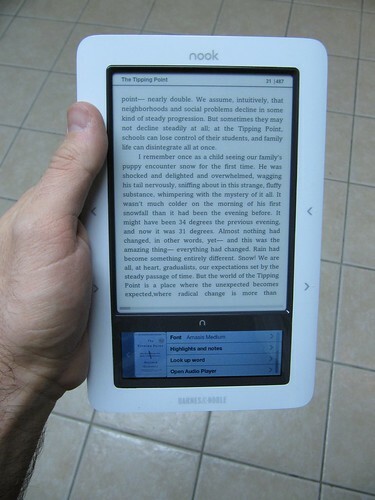 In fact, all three major ebook makers have their own solution for interactivity: Sony has a touchscreen surface overlayed on the e-ink screen, which some say makes the screen harder to read; Amazon has a physical keyboard; Barnes&Noble has the small LCD touchscreen. The LCD looks good, but is somewhat unresponsive. Using it as an on-screen keyboard works fine, but scrolling vertically through the iPod-style menus is clunky. As an iPhone user I am used to the buttery-smooth scrolling of the Apple device, in comparison the nook’s touchscreen is barely working. It seems more like a software issue than a hardware one, so I’m hoping they can make it respond more smoothly with an update at some point. Right now though, it’s very clunky. The B&N store on the nook is obviously a first attempt. It’s not terribly well-designed, and in a lot of ways seems broken. First and foremost, navigation is bad. Just going to “ebooks” gives a result something like “Page 1 (items 1-20 of 30,000)”. While I’m sure B&N wants to show off how many books they have available, putting them all in one long list (with no apparent order to it) is absurd, who is going to page through thousands of screens of random books? Going to a category isn’t much better, I went to “reference” and the books there seemed to be random as well, there were things like “The Adventures of Sherlock Holmes” in there. In fact, most of them seemed to be fiction, not reference. So whoever categorized these (or wrote the category code) did a terrible job. I think right now browsing the store is pretty unusable, I didn’t try searching for a specific book, but that’d probably be the best bet for locating content. The nook is a nice little device. I really like the feel of it and the design, aside from the flaws mentioned above. It seems like most of the issues are software ones, so it remains to be seen how aggressive B&N will be in doing updates. If they step up and work hard, they could rival Amazon. If they sit back, I think they’re going to lose out. Yep, old man Tevye is now 33. Friday evening, Sarah came by, and after a lot of nervous dithering on my part (I felt like I was forgetting something important) we set off for Maine. Along the way to Belfast, we stopped over briefly at Mike’s to drop off some things – I’ve been trying to somewhat optimize my posessions, so a lot of stuff has to go, and I figured Mike could make use of some of it, so I went down the list, and anything he wanted I put in my trunk. It was nice to drop them off, one batch of stuff gone. It was late, so we didn’t stop at Mike’s for long, just said hi to Mike, Alice, and their Mom, they gave me a bag of fresh catnip for Trouble, then we were on our way again. We got to Judy’s house pretty late, and fell asleep. The next day, we all gathered: Judy, Dan, Ted (Judy’s Brother), Mary (Ted’s girlfriend), Sarah and me. We went to a train museum, which it turns out is just down the road from Judy’s. I’ve walked by it before, but didn’t realize it was a museum, just thought it was a train depot of some sort. The place is run by a retired train engineer, part of a family of train engineers, with trains in his blod, and trains in his heart. Over the years, since he was a teenager, any time he saw something interesting heading for the scrapheap, he would rescue it. So over time, he has built up a collection of parts, train cars, and even buildings. He talks about the decline of railroading in Maine, and it is more than just history, it is his life. It reminds me of the Fisher King, this man’s life is so intertwined in the railroad, that it’s almost as if when he dies, the railroad dies with him. But then another member of the train group came by, a younger guy with a rotund figure, and led us on a tour of the train cars. A new generation, just as excited about trains. After the trains, we went to the co-op for lunch. The food there was yummy, and they were having a “customer appreciation day”, so there were tents in the parking lot with vendors giving out samples, local groups, and a used book tent. I bought 4 books for a quarter each. We sat on folding chairs and listened as David (my step-brother), Ezra Rugg (who I knew when I was little) and another guy played jazz. It was sunny out, but dark clouds loomed on the horizon. Everyone watched as they got closer and closer, commenting on the approach, but just sitting and waiting. Then it turned to a heavy downpour. People scrambled for cover under the tents, and the wind got so strong people had to hold on to the tents to keep them from blowing away. The rain and wind was intense, but blew by quickly. 10 or 15 minutes later, it was sunny again. That evening, we went to Havana restaurant in Bar Harbor, where Dan was playing jazz. There was a bit of a wait, we bided the time watching the bartender crank out mojitos assembly-line style, and a little girl dance while her parents drank. We finally got a seat, and the food was great. I got the filet mignon, and it was both melt-in-your-mouth delicious and well-presented. We got back to Judy’s around midnight, so it was off to sleep again. On Sunday, we went to a bakery for breakfast, then to Mildred’s house for cake. After that, Judy, Sarah and I went out to Ripley to see what was left of the old farmhouse. Like some kind of fairy tale, it was surrounded by a wall of bamboo which seemed impenetrable, until we discovered that bamboo is really easy to get through, you just plow right through and it snaps down in front of you. There wasn’t much left of the house. The roof had fallen in, and only my room and parts of a few other rooms remained. After poking around in the rubble for a while, we headed down the road to Wally Warren’s place. He had expanded since the last time I’d been there, in 2004 he added a house, and now has running water and electricity, new features to Wally World. Wally’s an interesting guy, and fun to listen to, and his art is fantastic. Having been at it for years, nearly every surface of his cabin, house, and yard is covered in some kind of art. Then it was back to Judy’s, and then home to my house. Sarah slept on the ride home, which is good, since once we got to my place, she had to drive another hour to get to her house. All in all, it was a fun trip, but woo, a lot of driving. All told, I drove around 17 hours that weekend. Had Adam’s birthday party last night. It was a lot of fun, we all met at our house, then went to a place called the Alamo for dinner. When I got my food, it was so much that after I had eaten my fill and passed it around so everyone could try some, there was still 2/3 of it left. Sarah and I ate the leftovers today for lunch. So it was literally enough food for a full meal for three people. And it was really yummy. After the Alamo, we went to Pinz for bowling. I bowled a 109, which for me is very good. A buncha pics are up on flickr. Went up to Vermont with Sarah for Meloo’s birthday. She’s renting a bee-yew-tee-ful log house in the Vermont woods with some friends. No neighbors, no sounds of cars, just peaceful quietude. We got there Saturday afternoon, the party was Saturday night, then Sunday afternoon we went to a swimming hole (cold mountain water! ).